Fig shows a schematic diagram of Bell-Coleman refrigerator (reverse Brayton or joule cycle). 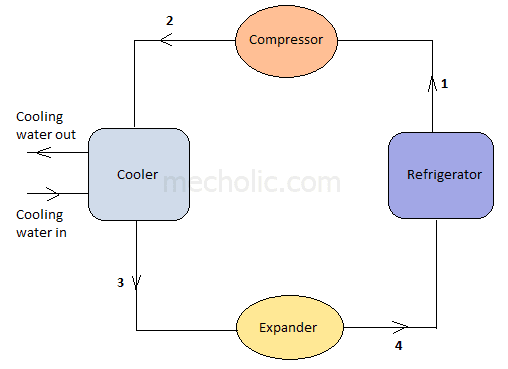 This refrigeration system components consists of a compressor, cooler, Expander, and refrigerator. In this process, heat absorption and rejection follows at the constant pressure; the compression and expansion of process are isentropic. Fig show P-V and T-S diagram of bell coleman refrigerator. 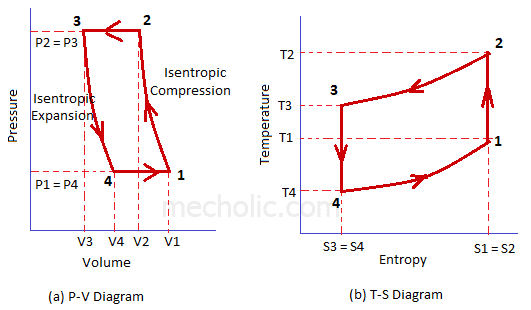 Here P1, V1, T1, S1 represents the pressure, volume, temperature, entropy of air respectively at point 1. And so on. It represents the corresponding condition of air when it passed through the component. 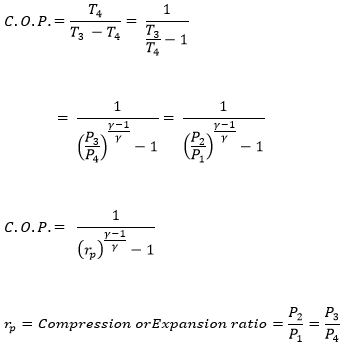 The Air drawn from refrigerator to air compressor cylinder where it compressed isentropically (constant entropy). No heat transfer by the air. During compression, the volume decreases while the pressure and temperature of air increases. 2-3: Constant pressure cooling process. The warm compressed air is then passed through cooler, where it cooled down at constant pressure. No heat transfer takesplcae. The air expands isentropically in expander cylinder. During expansion, the volume increases, Pressure P3 reduces to P4. (P4 = atmospheric pressure). 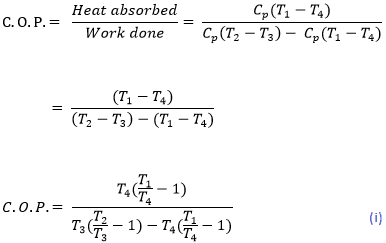 Temperature also falls during expansion from T3-T4.